There’s one little creature that I wanted to take a closer look at this Spring. It’s one that I see every year and yet they seem to disappear as quickly as they came and my chance at studying them in more detail is gone. Bombylius major. Sounds impressive doesn’t it. It sounds like it should be something huge and imposing, but it’s quite the opposite. Bombylius major is the Binomial or Latin name for the Large Bee-Fly, or just Bee-fly. It is recognised by its hairy, bee-like body and long proboscis (the pointy lance at the front). The proboscis is a fierce-looking appendage, yet it is quite harmless, used only to harvest the nectar from the early Spring flowers, especially Primroses. 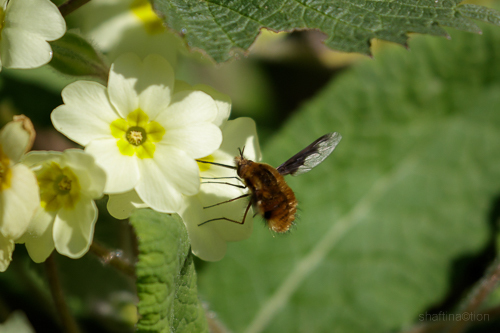 The Bee-flies favourite flower appears to be the Primrose which it drinks nectar from and, in turn, pollinates. Most people can encounter these little aviators in April or May, on a woodland walk, or even in the garden if they have their eyes peeled and take a closer look at some of the smaller looking bees attending the flowers. One will eventually turn out to be a Bee-fly and you will be able to watch it happily alighting on each flower, skillfully maneuvering its proboscis into the centre and lapping up the nectar. Don’t get too close though as they appear to have excellent eyesight and will fly away if you encroach on their personal space. Even though they seemingly try to make minimal contact with the petals (maybe through fear of predation) they do pick up pollen on their furry bodies and this is how the pollination occurs. A win, win situation for flower and Bee-fly alike. That’s all great and hunky dorey so far. Cute furry little critter drinks nectar and pollinates as it goes, but wait. There is a dark side to this story. The Bee-fly can’t go about its business unaided. It needs another insect to help it complete its’ circle of life and it’s a grisly tale indeed. Enter the unsuspecting Mining Bee genus called Andrena. 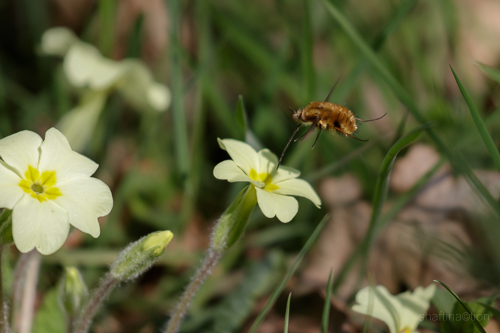 Bee-flies mimic and parasitise Mining Bees (above) by laying eggs in their burrows which hatch into larvae and eat everything inside it, including its owners. The Bee-fly mimics Andrena and, therefore can get very close to their burrows without detection. Once there, the Bee-fly hovers above it flicking her eggs into or near the burrow entrance (it probably depends on the skill of the individual Bee-fly). When this insidious payload hatches they head into the burrow and feed on the food supplies that the Andrena has put there for its own young. The subterfuge doesn’t end there however. Once the food has gone the Bee-fly larvae will proceed to consume the Andrena larvae and then pupate until the following spring when it emerges into an adult – circle of life complete. Now, I chose Andrena as the example because all the information I have read on this area of the Bee-flies life points to them favouring this species. They do in fact use other burrows like that of beetles and even mining wasps for the same purpose. 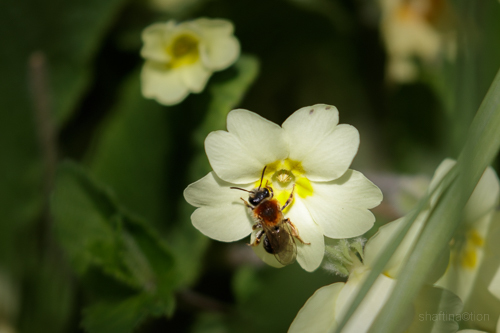 It’s also no surprise that Andrena feed and gather on the same flowers because another tactic that the Bee-fly employs is to lay her eggs on these flowers in the hope the larvae will attach themselves to a passing host species and travel back to the burrow with it. The Bee-fly is recognised by its hairy, bee-like body and long proboscis. I’ve always thought that the Bee-fly looked like a bee to stop other stuff eating it and perhaps that is one reason. I mean,if a bird thinks it’s a bee it might not bother trying to tackle it for fear of getting stung or a toad or frog might think twice about plucking one from a nearby leaf. Learning that they use their disguise to gain access to hosts’ burrows is quite an eye-opener for me and I’m guessing both reasons could be true. One thing’s for sure, learning more about the humble Bee-fly this Spring has been a pleasant and sobering experience. We very often only see the pretty side of life when so much more lurks underneath. ~ by shaftinactionn on April 19, 2015. 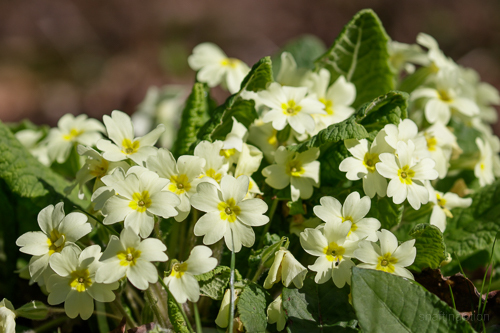 But aren’t those simple Primula vulgaris just the sweetest little flowers of Spring, you have ever seen? 🙂 Thanks for showing the ecosystem around them!